What did you think of Waterloo Bar and Kitchen? Lovely venue with friendly welcoming staff. Perfect if you're seeing a show as it's right next door to the theatre! I attended a business meeting in the lower level private room some weeks back and I was suitably impressed by the level of service myself and my staff received. The service was efficient without being full on, and the waiting staff really took our needs into account. Between us we have a variety of differing dietary requirements that we had discussed with the restaurant beforehand, and these were all accommodated for perfectly. I very much enjoyed my seafood and chorizo salad, followed by a rather delicious lamb dish. The icing on the cake had to be the location - a perfect distance from Waterloo station and opposite a busy bus stop, meaning we all got home without too much faff and fuss. 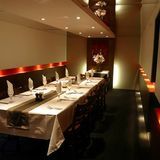 I would not hesitate to return again, either to take advantage of the private room or for a more relaxed dining experience. After a night at the Old Vic theatre, Waterloo Bar and Kitchen seemed like the perfect choice for a quick meal before heading home. It is right next to the theatre and the staff really know what they are doing! I had the chicken and my partner had the steak. Both were excellent, as was the crumble for dessert (and all the wine!) We will be back. Had a 30th birthday meal here yesterday lunchtime. Great atmosphere, friendly staff and amazing food. The lamb was the best I have ever tasted. Can't recommend enough. I have been a regular at Bar and Kitchen for a few years now and I just keep wanting to go back. The menu is great balanced, lots of fish, and well priced. Each time I go there are four or five dishes, from each course, I want to eat. The food is always excellent, the halibut is particularly good and so is the duck as well as steak, fishcakes, the lamb sea bass and so no. Service is great and the manageress seems to know everyone. The dishes are reasonably priced and better value than a lot in Waterloo. Definitely my favourite restaurant in the area. The Waterloo has a fantastic function room! A group of my old friends and I have struggled for ages to find a place to meet and have dinner each month. 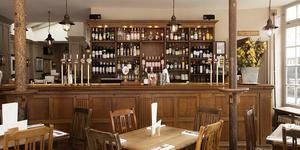 Waterloo Bar and Kitchen has a fantastic function room that is two minutes walk from Waterloo Station. The food and service is brilliant. They even have an official function co-ordinator which made everything so easy. Use this function room! 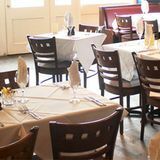 Waterloo Bar & Kitchen is a lovely restaurant with a great atmosphere and delicious food. Conveninetly located at the side of the Old Vic for a perfect post or pre theatre dinner. The king prawns were a delight - and the chef makes the largest creme brulee I have eaten! You should check Waterloo Bar & Kitchen out. Been eating at Waterloo Bar & Kitchen regularly for some months. It just gets better and better. Waterloo Bar & Kitchen has a super menu to suit all, wonderful food and service, good wines, great buzz and a a price we can all afford. The icing on the cake - Sunday brunch to die for. The Waterloo Bar & Kitchen is a gastropub for sure, but one that is straightforwardly classy, rather than poncey. The Waterloo Bar and Kitchen is popular in the early evenings with those en route to the nearby Old Vic, and the food is excellent. As far as the drinks go, there's a reasonable range of continental beers on the pumps, and a German wheat beer that puts the stuff they sell in Sam Smiths pubs to shame. It's a great place to eat in and drink - reassuringly civilised.